The life of a community newspaper photographer is marked by a myriad of big and small seasons. Sports Championships, Graduations, Holidays, planting and harvesting, and that first week of Summer. The last few days of the year, a relatively slow time, are a time of reflection for us, as we gather our favorite photographs to share with the community. As I've searched through our archives and my blog to find my favorites, I'm reminded of the stories I've been able to tell and the lessons I've learned over 2013. ... some feature photos you see on the way to another assignment are just gifts from the "photo gods" and to never take them for granted. ... some photos are worth getting soaking wet for. ... life is fleeting, but how much joy it can bring! Thank you for your support by looking at my photographs! Whether you are part of the Upper Valley Community, a friend, or you stumbled upon this blog, I am happy you're able to share these moments with me. Happy New Year! 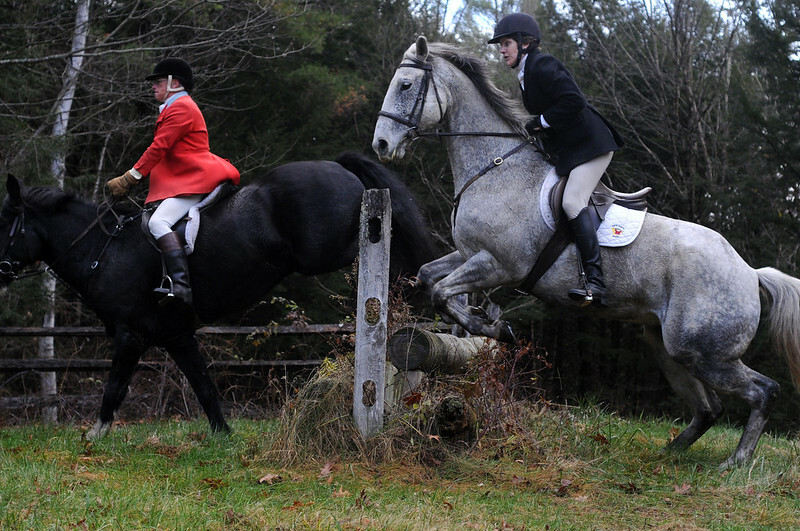 (Note: I rode along with the North Country Hounds twice, using a borrowed horse to photograph while foxhunting. I also went a third time on foot, so I could spend a little more time crafting photographs rather than controlling a horse. I wrote the article that accompanied the photo page as well, talking about foxhunting in general, and my personal experience.) ------- This is not a typical workday. It’s 9:30 a.m., and I’d normally just be arriving at the office, ready to check my assignments for the day. Instead, I’m trotting along on a borrowed horse in the countryside of Lyme, fox hunting with the North Country Hounds. Based out of West Windsor, the group’s 50 or so members travel to properties around the Upper Valley, from August to December, for their twice-a -week hunts. I’ve wanted to photograph this historic activity for many years, and as an avid horseback rider as well as a newspaper photographer, I jumped at the chance to work from the back of a horse, which would give me a front-row seat to the action without having to chase the group on foot. Fox hunting hasn’t changed much in hundreds of years. The riders wear traditional velvet helmets, beige breeches, or riding pants, long boots, a white stock tie, and a red or dark-colored jacket. The hounds, usually about two dozen, are guided by a houndsman, who calls them back into a group with voice commands or a hunting horn. The riders follow the hounds and are guided by a field master, who keeps the two groups from colliding. In this way, the pandemonium of horses, riders and hounds — and the potential fox — is kept in check. “Hunting,” however, isn’t an accurate description of what this group does. The hounds chase a line of scent the fox has left behind during the day, long after the creature has nestled down in its burrow. 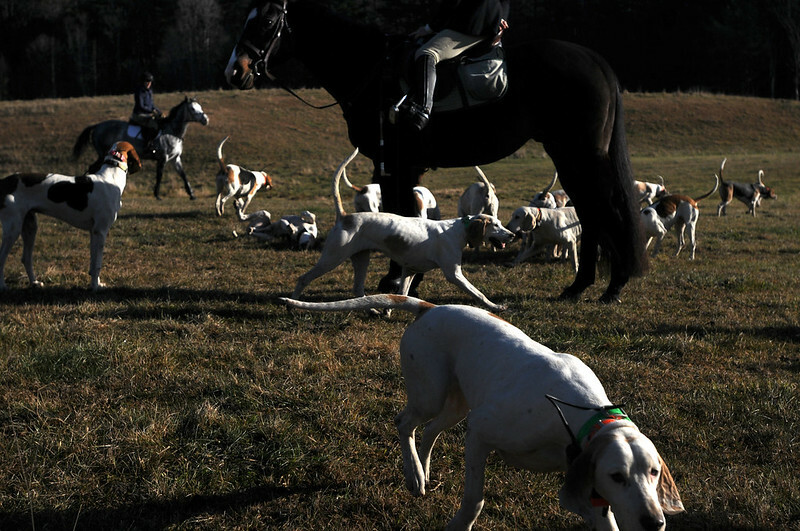 Vernon Studer, master of foxhounds for North Country Hounds, said a better term for the sport is fox chasing or scent chasing. In the rare event that a fox is found, the hounds are called off. The regulations governing the use dogs to hunt foxes vary by state, but since the club was established in 1983, it hasn’t killed a single fox. Modern technology also has changed parts of the sport. Each hound wears a radio collar so dogs that stray from the group can be tracked. The hunt staff communicates through two-way radios. I hear the hounds baying from inside the truck used to transport them from Vernon and Sandy Studer’s West Windsor home, where they care for the hounds year round, to where the day’s hunt, or “fixture,” is to be held. The members of the club also help care for the hounds with membership fees from $300-$600 depending on age, which goes to the cost of food and veterinary care for the hounds. As the two dozen riders, who range in age from 8 to 80, prepare their horses by brushing and saddling them, I bounce back and forth between photographing and grooming Prithe, a stocky Icelandic horse and a hunt veteran. She stands quietly as I buckle a camera bag to my waist and mount up. 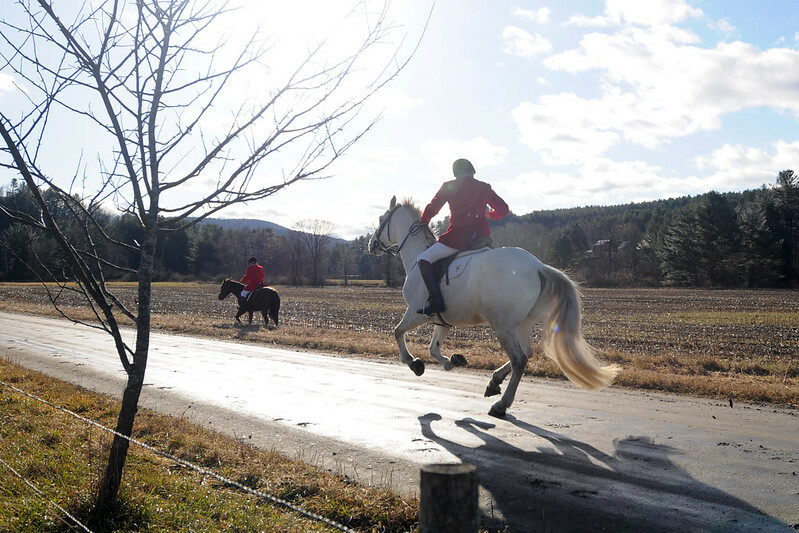 The horses break into a fast trot toward River Road, and we cross into a field by the Connecticut River where the hounds are released. 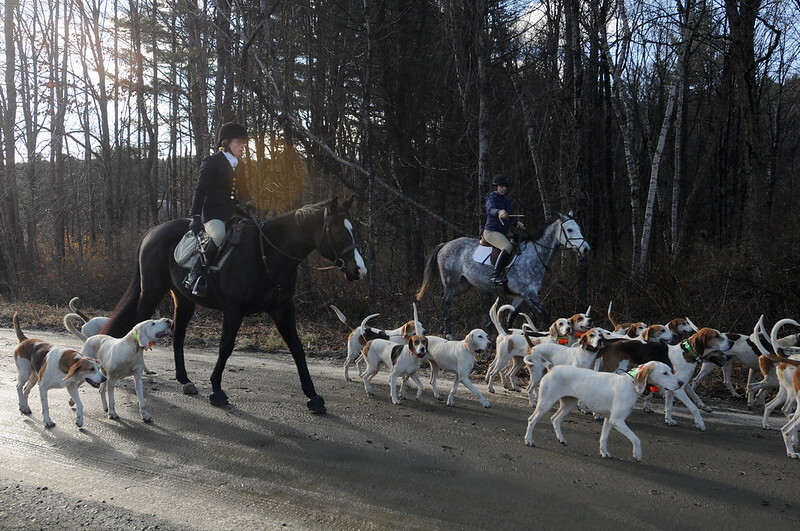 Sandy Studer, the huntsman, “casts,” or directs, the hounds to search for a line of scent. It takes only 10 minutes of running back and forth along the river, noses down in the grass, before the hounds catch the scent of a fox and scramble over, under, and through the woods, baying and howling as they go. “It’s the most beautiful music,” said a rider next to me as we waited for a signal from the field master. Prithe stands alert, almost quivering, as I hold her back, waiting for the go ahead to give chase, allowing the horses to gallop in pursuit. Moments like this are impossible to photograph. I’m too busy whipping around corners in the woods at a full gallop to be able to reach into the pouch on my hip and grab my camera. 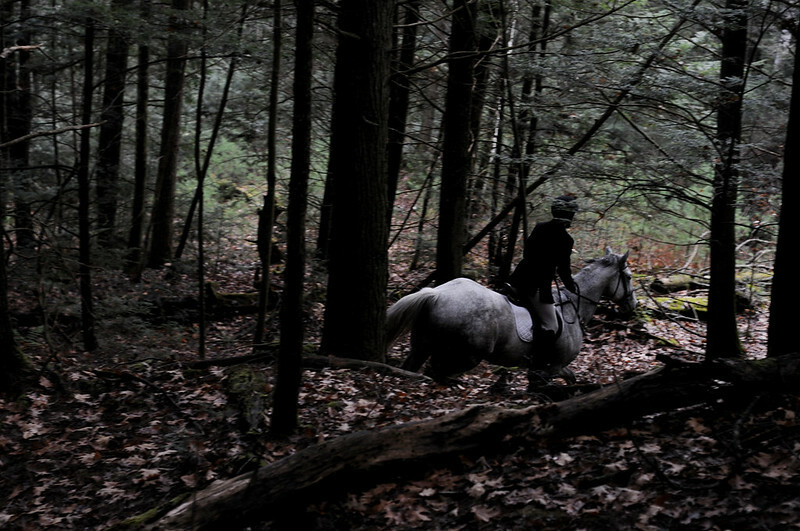 But once we slow down to a canter, and I’m spending more time urging my horse forward than holding her back, I’m able to hold the reins in my left hand and my camera in my right, photographing the riders in the woods ahead of me. After a good chase for an hour, we lose the hounds. While the hunt staff heads off to round them up, a group of riders who’d rather stay on their horses tackle some jumps before dismounting, brushing and guiding their mounts back into their trailers and heading into a member’s house for a potluck lunch. It’ll be almost an hour before the hunt staff comes back to join in the meal after finally finding the rest of the hounds and herding them into the truck. As I head back to the office and change into my work clothes, I reflect on my multitasking adventure. The adrenaline from the chase hasn’t worn off quite yet, but my blistered feet from the long boots I wore are beginning to hurt. I have a few hundred photographs from the day, but what excites me more are the good conversations I had with the riders beside me as we galloped through the woods. I suppose what keeps members hunting twice a week for several months isn’t just the excitement of the hunt, but rather the community they hunt with.